Between planning for my holiday, being on holiday and then being ill (properly ill) I’ve done practically nothing to further the cause of “Socktoberfest”. 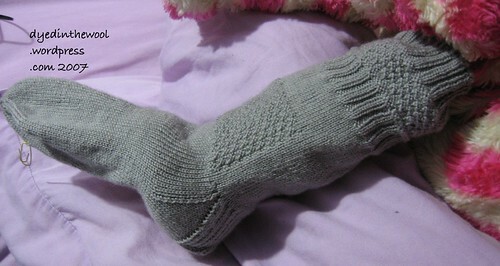 I did manage to finish the first of my mum’s “Little Child’s Socks” sock, but I’ve not cast on for the second, yet. A better photo of the sock, modelled by my pyjama case as usual. I’m not entirely sure that it’s long enough to fit my mum. Under intense interrogation, she said it was fine, but I’m still not sure. I think I’ll knit the other one with a few more rows in the foot and get her to do a “blind fitting”. 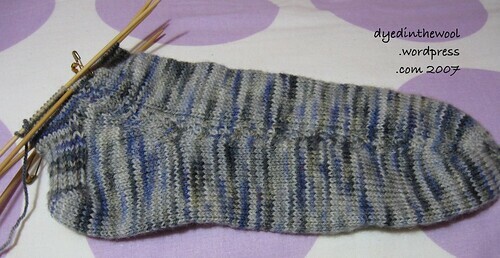 I also made some painfully slow progress on the Boudica sock (pattern now available from Miriam herself). I changed the heel from a stocking stitch to a slipped stitch because the yarn is very soft and I want to give it a fighting chance in my shoes! I have made some decent (if slow) progress on my dad’s Christmas/New Year/Mid-May Birthday present (delete as appropriate, depending on how long it actually takes me). It’s a saddle-shoulder do-hicky, knit from the top-down using instructions from Barbara Walker’s invaluable tome “Knitting From The Top”. Photo shows 1 and a bit repeats of the back pattern. I developed a new symptom (or possibly a new infection) a few days ago, so not only have I had a very sore throat, aching limbs, vomiting, tummy pain and dehydration, I now appear to have a cold. (Wistfully) What’s it like having an immune system that works? I know hearing about how someone else is really ill is as dull as ditch water, but it’s either this or going through the details of my disability benefits tribunal. You can have a vote, if you want! Oh, and Halloween this year? No kids came to the door. RESULT!!!! (fist pump). Word’s got around that I don’t answer or that I give out boxes of raisins (both true). Those were the words uttered by my dad upon being asked if he wanted me to check the design of his Aran jacket with him. I like to name the stuff I design, because calling something “My Dad’s Aran Jacket” takes up too many words and too much energy! Hence forth, it shall be known as Riker. As in William T. Riker. From Star Trek. I like to think that in his time off from Captaining a starship, Riker would scoot on over to a log cabin and throw on a replicated aran jacket. What do you mean it’s weird to imagine sci-fi characters doing that sort of thing? It is not! These are the patterns I’ve picked out, and it’s now a matter of getting the maths right. One slightly good thing about all the stuff recently was that I got my dad’s measurements for the garment. I’ve been going along quite nicely on these now. I checked with my mum whether or not she wanted the sock smooth in her shoe and she said “Yes”, thereby making my life a little easier! For my own tastes, I would have continued the pattern onto the instep, but I’m making these for her, not me. For want of a better name for it, the tank is coming along nicely. I’m on tier 6 of 7 in the smaller needles. You change up sizes to knit the lower three tiers on the bodice. It’s fairly repetitive, but that’s what I need right now, especially since the universe decided it would be quite funny to give someone (my mum) with TMJ (temporomandibular joint syndrome), laryngitis and to have the infection go into their jaw. Universe? I’m not laughing!